This summer has been a whirlwind of activity. I really don't know why I expected that I will "accomplish" anything like cleaning the office, reorganizing my life in any way or even getting the laundry done and the bills paid on time. The house has only been vacuumed twice since the last day of school on June 22. I blame it on the sun. The weather has been lovely all but 2 days so far which is not good for the garden. We need rain! But it has been fun spending hours on the beach with friends, enjoying week long family visits and attending many, many Cape Cod League baseball games on hot summer nights. Obviously, there has been little time to cook and post recipes. However, I am now on instagram under the name: Notes from Val's Kitchen....so follow me! There are lots of great photos of what we have been up to during these last 6 weeks to prove that I haven't just been hiding out at home watching Bravo and eating potato chips. On those few nights that I am actually at home and have the luxury of putting my feet up while watching some "light murder" on t.v. (I love "Elementary" and "Miss Fisher's Murder Mysteries"), I often throw together something to go with my glass of red but in secret so that the kids don't hear me and want some. Piggies! I use leftover cookies crumbled over a dish of the last of the remaining ice cream or if there is nothing else, semi sweet chocolate chips shoved into a glob of peanut butter. However, recently when we were all actually home for dinner one evening last week, I was able to make Peach Parfait with Salted Graham Cracker Crumble from this month's Bon Appetit http://www.bonappetit.com/recipe/peach-parfait-with-salted-graham-cracker-crumble Delicious! But the very best part was the crumble and thankfully there was lots left over. Crumble, I have found makes anything into a dessert and makes most desserts even better. Even a simple dish of yogurt and fruit can be transformed. Crumble is far superior than cookies when layered into whipped cream and lemon curd (another simple, yet addictive concoction) because the crumble stays crunchy longer, it resists getting soggy. Crumble is also divine just tossed into your mouth as you are passing through the kitchen. Just ask Ava, crumble thief. 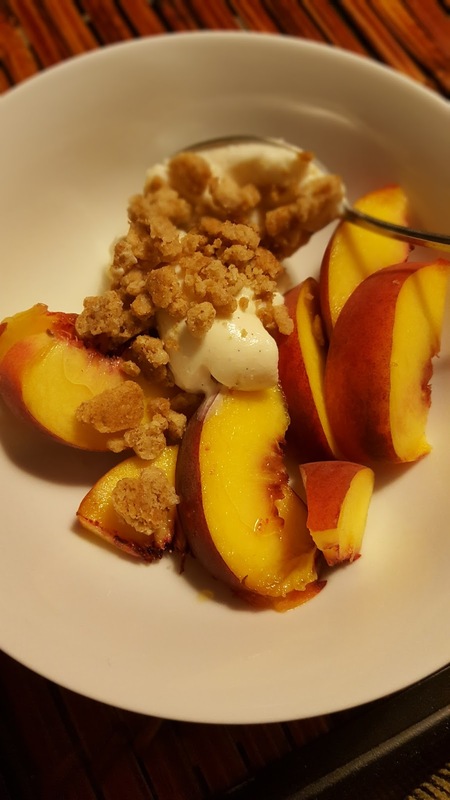 So, with the remaining crumble that I was actually able to keep for myself, I made this easy combination of Cabot Greek Vanilla Bean Yogurt and some sliced fresh peaches to go with some delicious pinot noir and enjoyed it alongside Sherlock and Watson on recordings. She calls it "Crisp Streusel", I won't argue with that. Or, you can click on the link mentioned above for the peach parfait which is definitely "parfait" as the french say. Either way, be sure to keep some of the crispy goodness for yourself to go along with an evening cocktail and a mysterious dead body. Put all ingredients except oats into a bowl and blend by rubbing the dry ingredients into the butter with your fingertips. Work quickly so that the butter does not melt. When the mixture looks like coarse sand, add the oats and mix well. Spread on an ungreased baking sheet. Break up any large chunks into crumbs, about 1/4 to 1/2 inch size. Bake for 30-35 minutes, until toasted and browned, stirring occasionally to prevent burning, especially in the corners and to turn over the unbaked portions. Let cool completely, then freeze until ready to use. The streusel can be frozen up to one month.